Discussion in 'Vendors' started by rides2little, Nov 12, 2017. I know there are a lot of words here but I would bet I answer all your questions in this one post so please take the time to read it through. 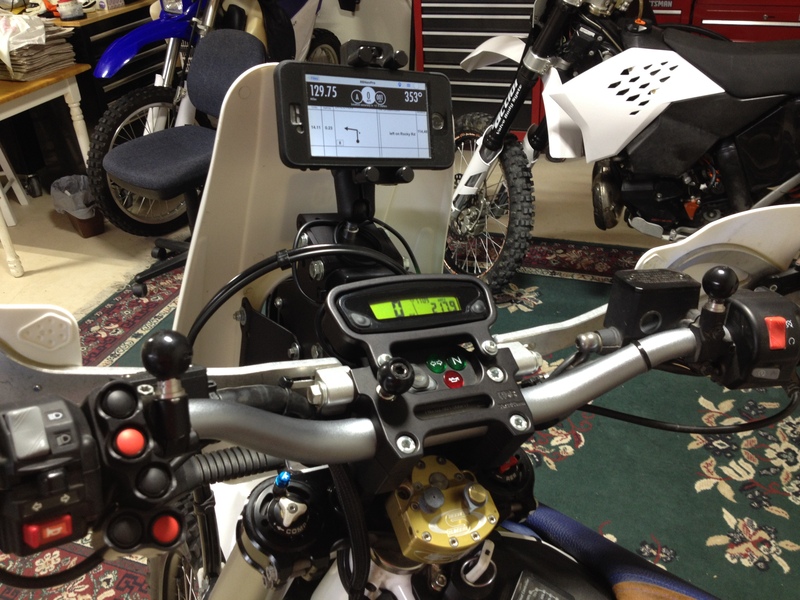 For those that wish to purchase a set, instead of building your own, we have here a turnkey DEDICATED Bluetooth remote and handlebar button set compatible with the full version of the RallyBlitz Nav Pro app for the iPad mini. They also work with the newly released Rally Navigator roadbook app as well as the Android MDR Roadbook app!! What these buttons WONT do: They won't work with a traditional setup and aren't intended to compete with F2R/ICO/LPR controls. 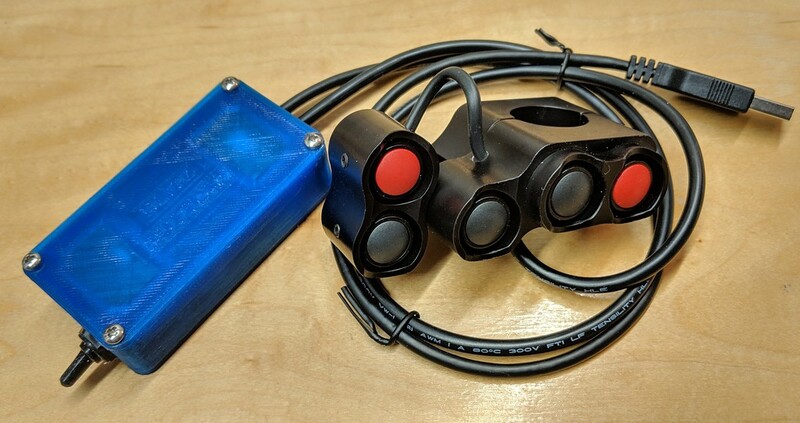 The M8 connector version (without buttons) is the only type to integrate with traditional controls like F2R/ICO/LPR, giving existing paper roadbook users a simple digital option for training without threat of wrecking their expensive nav gear. The buttons will also only connect to one device at a time. They are meant to work with one app running on one device at a time. The CNC aluminum button housings/bar clamps are produced through Highway Dirt Bikes. The buttons themselves are metal housings and waterproof/dustproof. The backs of the switches and wires are sealed with potting silicone (non-corrosive). The Bluetooth boards used are based on BT 4.0 and will only work with iPhone 4s and newer. Any cellular version of the iPad Mini is fine. When shopping for an Android Tablet be aware that it needs Bluetooth 4 to work with the buttons, check the specs as they are all over the place. The boards are the Adafruit Feather 32u4, programmed with the latest HID keyboard emulator programming. They are primarily powered by the USB cable and have backup power from a small battery in the case. When plugged into a USB port the switches are automatically powered on. 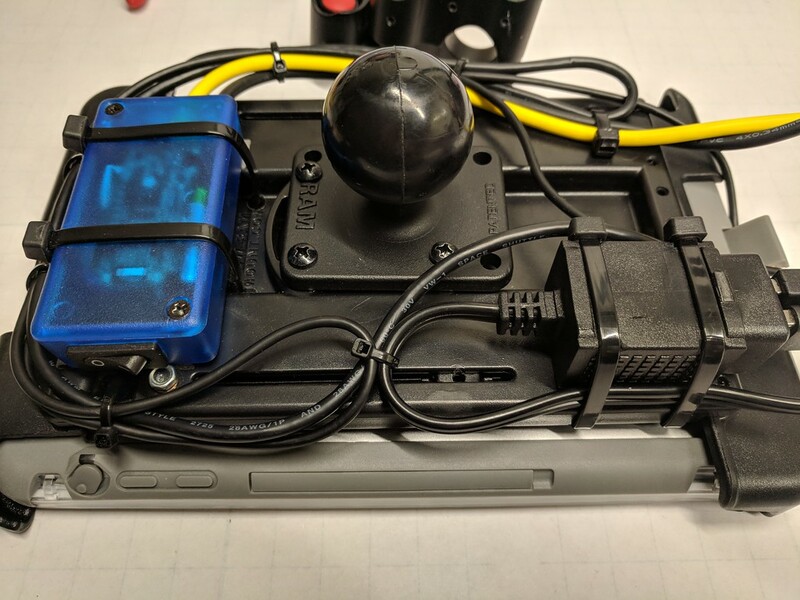 The toggle switch on the case allows for the internal battery to power the device and battery charging if connected to a USB connection. There is battery charging/discharging safety built into the board but as with any battery these days be mindful to turn the device off and make sure all the lights are off on when done. I would strongly recommend the BlueSeas USB ports wired with a 5amp fuse to the battery to supply power to the iPad mini and the button set. The master device (Ipad, iphone or similar) has to pair with the remote device (Blitz Buttons in this case). 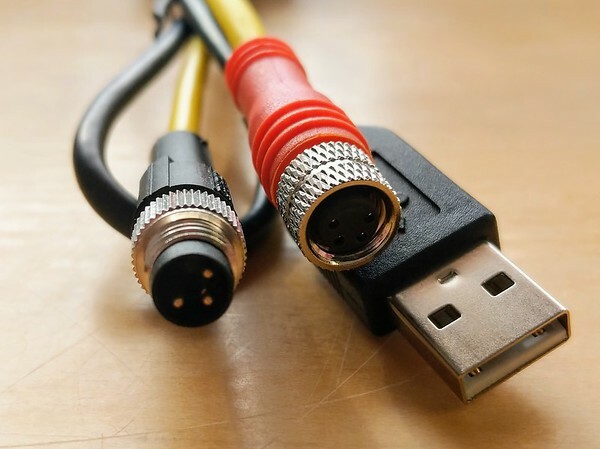 Master devices can have more than one remote BT device connected at a time but you can only connect a remote device to one master at a time. If you encounter connection problems, go to BT settings on the master device and 'forget' the device in the bluetooth connection manager, then turn off BT on iPad using the slider widget, wait 10 seconds, turn BT back on, then turn on buttons and 'pair' via ipad. 1) Turn on bluetooth on device. 2) Power on button set. 4) Accept 'Pair' in popup. The cost for the 5 button set is $185 plus shipping. The cost for the 3 button/Toggle set is $195 plus shipping. I will accept paypal (even credit cards) and checks once they clear. Shipping/handling charges will just be whatever USPS charges, nothing beyond that. Shipping in the US is typically (~$11) 3-4 days and to Europe (~$35) it has been at least 8-10 days. Let me know if you have any questions. I will try and be timely in responses but I do have a day job and am not always in front of a computer. These are the three types of button sets that I am producing now. Buttons are all red and black. All the buttons will work with a continuous push and will scroll continuously or change the odometer until released. For those who already have a traditional roadbook and ODO setup and want to try Digital Rally here is your solution. 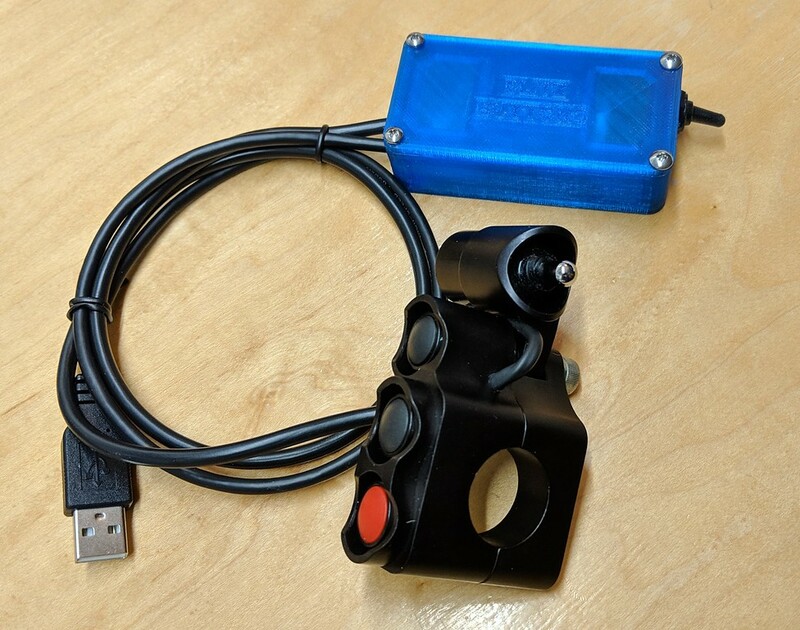 You use your existing ICO/F2R/RNS buttons/toggles and just use the standard M8 connectors to connect to this enclosure. Down and Up for the power toggle are relative to the logo and silver screw heads being the top of the device. Without the USB cable plugged in and the black rubber toggle down the device is completely off. If you plugin the USB cable it will turn on and you will see the blinking red light through the lid/top. If you then raise the toggle you should still see the red blinking light and also a yellow light at the other end. The yellow light means it is charging the small internal battery. The battery is meant to keep the device running for short periods if you lose USB power but won't run it very long (a couple of hours or so) if the USB is disconnected. This is how I suggest you use the device when navigating. The board seamlessly transitions from USB to Battery power and back without a hiccup. You can turn on the device (assuming the battery is charged) by raising the toggle when not connected to USB. 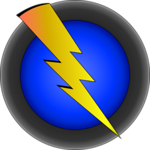 You can't over drain or over charge the battery but I wouldn't leave it plugged in for days on end to a live USB port. The translucent sections of the lid to the enclosure allows you to see the status of the board via its 3 lights. When you power it on there is a red flashing light. 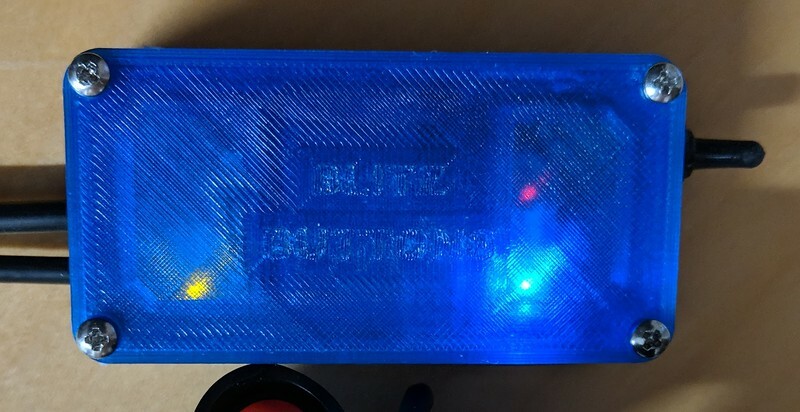 Once paired there is a solid blue light and when charging the onboard battery there is a yellow light at the other end of the board. The board enclosures are highly water resistant but not totally waterproof and should be placed somewhere they won't get drenched and remove before washing the bike. Here is a quick video showing how the buttons work with the Rally Blitz Pro app. This is one option for a quick removal, self contained setup. 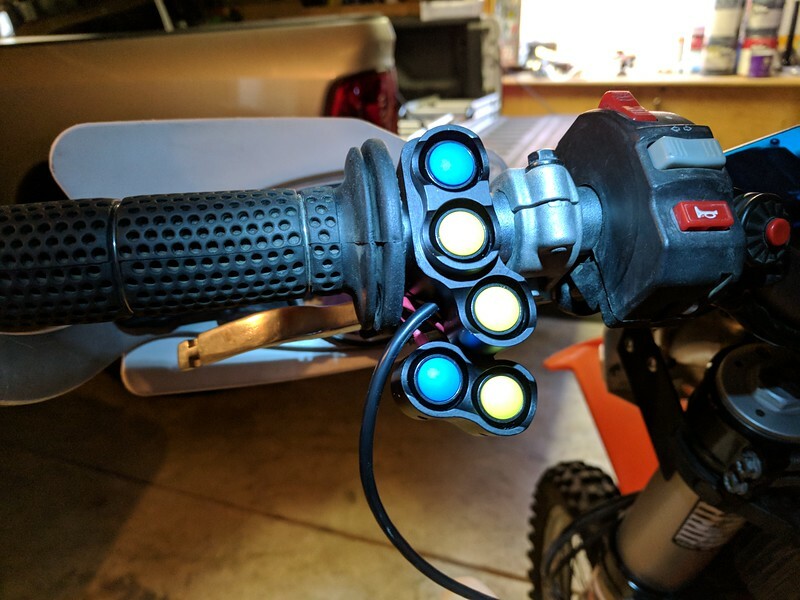 I have had a few questions on what the latest mounting options are for a lite setup. This is what I have been running lately. I have thousands of km so far with no issues, even with some good offs, drops and compressions. It comes on or off the bike in one piece in less than 5 minutes if I just leave the Ram mount on the bars. The only 'modifications' I did were to drill the back RAM plate to match the tablet holder because I was impatient on trying to find the right RAM part to fit and then to put two sheet metal screws into the back slider portion of the tablet holder since it is only spring loaded and I wanted it a bit more secure but it might work fine as is. You can see the screws on either side of the BT button controller box. Also a few well placed holes for some wire management zip-ties, don't pull too tight. 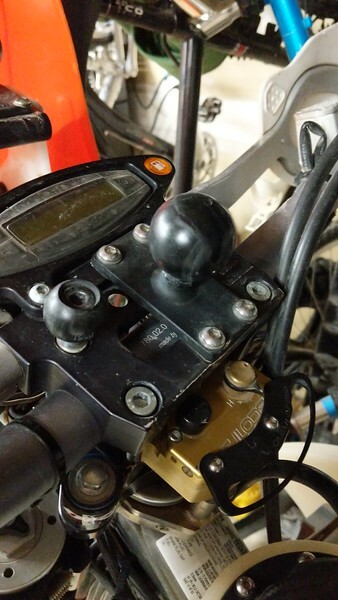 Here is how I mount it on my Frame Mount Highway Dirt Bikes rally kit. Here is the RAM plate mounted on the top clamp (also HDB). What the buttons look like mocked up on the bars. 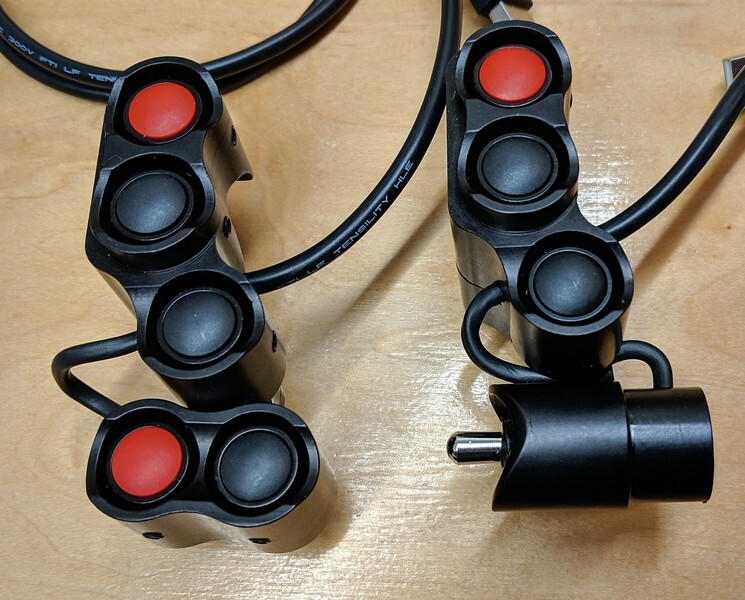 The black cable would be ziptied safely to the bars, this was just a quick mockup to show the buttons on the bars of a bike. The bottom two buttons can rotate a bit, side to side, to personalize the fit as you wish, just an allen bolt accessible on the back. This is probably the cheapest way to try out Rally Navigation short of a tupperware setup where you are hand turning the roadbook. DirtJack, RenoMoto, ScooterNoMore and 22 others like this. Well done R2L / HDB. Those look sweet! Just so I'm clear, each set has all five buttons? I've never seen HDB buttons in 5 button clusters, only their 2 or 3 button clusters. 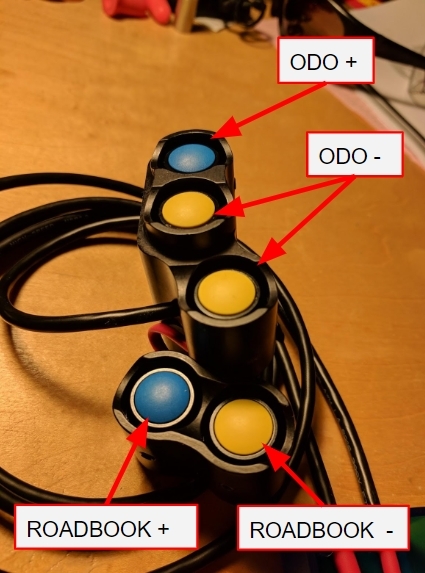 Related to that, what was the rationale for the 5th (2nd odo-0.1) button? Not judging. Just curious. I'm a few months away on my rebuild to still address the nav switches - but will pm you to get the ball rolling. Congrats in advance. 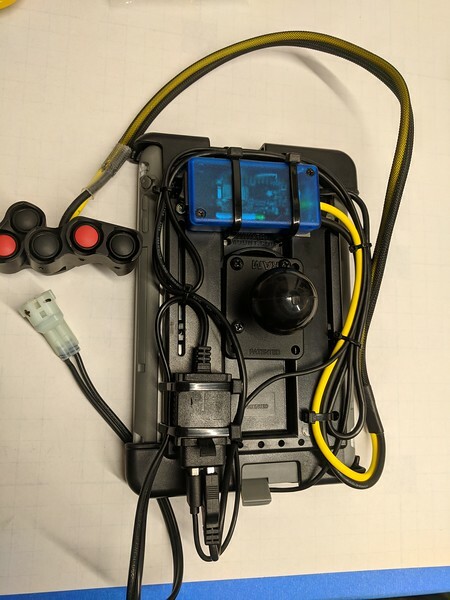 You've identified a great opportunity-may it be "fruitful"
The 5 button setup is what Paul was creating already for a traditional rally setup with the top three buttons being used for ICO/RNS type trip meters with Mode/+/- .... Cheaper than re-tooling for just 2 buttons and more aesthetically pleasing than leaving an empty hole in the current mount I chose to install two odo - buttons. Great timing! I just purchased a iPad mini 2 and have a Lifeproof case the mount on the way. Can you post a picture of the buttons installed on a set of bars? I've never seen HDB buttons in 5 button clusters, only their 2 or 3 button clusters. The bottom 2 button cluster is attached (can be removed) to the top 3 button cluster. I have a set from Paul where the bottom (black) button of the upper cluster is wired to generate RB up which I prefer over the ODO back. That way I have the 3 most often used buttons in the top cluster of 3 switches. See image in original post now. Is that what you were looking for? The only reason I didn't do it that way is that if you do transition into a traditional paper setup at some point the scroll function is all lower thumb motion with the toggles typical to those units. The top three are typically just ODO trip meter oriented. 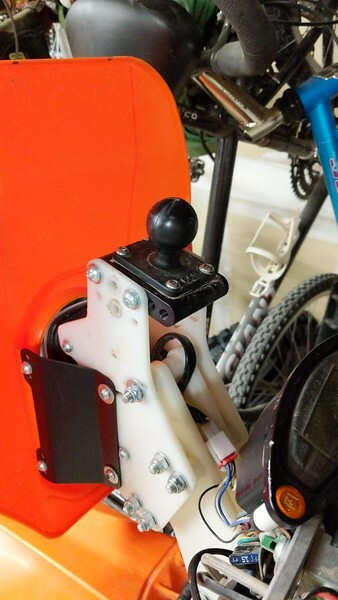 The bottom two buttons on these setups are physically wired to the top portion and therefore are not completely removeable, only enough to get the lower half of the bar clamp on and off the bars. There is also only one cable going back to the bluetooth controller. This is done from a cost and simplicity standpoint. The only reason I didn't do it that way is that if you do transition into a traditional paper setup at some point the scroll function is all lower thumb motion with the toggles typical to those units. I wasn't very clear in my previous post. The bottom button of the top cluster and the left button of the bottom cluster are both wired/programmed to do RB forward. I haven't potted my switches yet, what type of silicone did you use? I completely understood your comment, no confusion. See my revised post above that you quoted. I have used Loctite 5040 and MG Chemicals premium RTV Silicone. The important thing is to get one that doesn't have Acetic Acid or smell like vinegar. Great news and I'm very excited these are happening. I have used Loctite 5040 and MG Chemicals premium RTV Silicone. The important thing is to get one that doesn't have acetone or smell like vinegar. Thanks for your response. I like what you are doing. I get your reasoning now. I'm and old guy who will never be doing any kind of racing again so I will never have to re-train my lower left thumb for the RB toggles. I'm just having fun learning RB navigation. I've always used maps (including Google and other) to plan rides and sometimes build roll charts. The digital way of doing this seems very appropriate for me, being a retired university CS prof.
Ah, mode select - hence 3 buttons. Makes sense. Yup - that helps. I'll send you a pm when I got my build to that point. Looking good Chris, with all the parts and touch labor it's a bargain at that price! barnold99 and VxZeroKnots like this. Agreed, that price is very reasonable. Here's what the setup looks like without the "second" odo button. Great work on these Chris! How stable is that ram mount ipad setup? @Gany The 1.5" ball holds it really well. This is larger than the standard 1" stuff. The iPad and case don't weigh very much at all so there isn't a ton of mass to keep from moving. Currently only have the blue/yellow set ready to ship. Building more over this weekend with red/black buttons. Thanks for those that have purchased already and should be getting them soon.